In August 2010, Baltimore Gas and Electric received permission from the Maryland Public Service Commission to overhaul its network of electric and gas meters that perch on the walls of homes and businesses in 10 counties and the city of Baltimore. Inspired by programs in California and Florida and bolstered by a $200 million federal grant, the utility set a plan in motion to replace customers’ electric and gas meters with a grid of digital “smart meters,” which continually send energy consumption data wirelessly to the utility. Other benefits of a “smart grid” include more accurate monthly bills, quicker response to power outages and less energy use across BGE’s service area, Butts said. For the most part, the rollout, which is nearing completion, has gone smoothly. BGE alone has changed out more than a million old-style analog or digital meters, replacing spinning dials with digital displays and online charts. Customers can log in to a website to view their power use down to the minute, and meter-readers have been retrained for other positions as radio-frequency signals in the air replace people and trucks sweeping the neighborhoods. But on the other side of the power line is a population of holdouts and their self-appointed advocates: a band of concerned residents who dispute nearly every claim they’ve heard from utilities across the state about the new grid. The holdouts are a relatively small percentage of customers — about 25,000 from BGE, Pepco and Delmarva Power’s combined customer base of a few million — but they’ve made their voices heard very clearly in government and their communities. Maryland Smart Meter Awareness, an anti-smart meter advocacy group, sprung up in a quiet northwestern Baltimore suburb where analog meters still spin and many lawns and car bumpers sport red-and-white “Say NO To Smart Meters” signs. The group’s 1,100 members are the sort of people a video on BGE’s website dismisses as “conspiracy theorists” — but they say they’re protecting Maryland’s citizens from physical and financial harm. Here’s what the sign says. Libber said he is concerned that the radio-frequency microwaves smart meters emit could cause a host of health problems, from headaches to insomnia to cancer. It’s a contentious claim, given that microwave ovens, wireless Internet routers and cell phones all produce the same frequency of radiation. and the smart meters are much further away for humans. But Libber said there hasn’t been enough research to determine how radio-frequency radiation affects humans. BGE’s sizable online guide to concerns about smart meter cites Federal Communications Commission standards for radio-frequency waves, which occupy the section of the electromagnetic spectrum between 3 kilohertz and 300 gigahertz, below the visual spectrum of light in terms of energy. “At relatively low levels of exposure to RF radiation, i.e., levels lower than those that would produce significant heating; the evidence for production of harmful biological effects is ambiguous and unproven,” according to the Federal Communications Commission’s Radio Frequency Safety guide. The government agency and anti-smart meter activists agree that more research is needed. But the two sides disagree on whether that’s a cause for caution. Smart meters communicate with the grid for less than two minutes per day, emitting a comparable amount of radiation to a 10-second cell phone call, according to BGE. Ronald Powell, a physicist who worked at the National Institute of Standards and Technology and who is now affiliated with Maryland Smart Meter Awareness, said that when it comes to radio-frequency technology, “our society has gotten ahead of the research community” with plentiful wireless devices. “Human beings are very complicated biological systems, and it’s going to take a while to ferret out everything.” But in the meantime, Powell said, “the last thing we want to do is to mandate this on the public” through wireless smart meters. The smart-meter opponents point to stories of people who developed new or aggravated symptoms after being exposed to smart meters. Some of these people have been diagnosed with electromagnetic hypersensitivity, which is not widely recognized by the medical community, Libber said. Libber said he avoids excess radio-frequency radiation by keeping his wireless Internet router in an air duct behind a metal vent, putting his cordless phone transmitter in the basement and holding his cell phone away from his ear when he makes a call. While Maryland Smart Meter Awareness paints the smart grid as a burgeoning public health nightmare, Butts and BGE portray it as an exciting opportunity years in the making. After conducting a pilot program of about 5,300 electric and gas meters in Westminster and Baltimore in summer 2008, the utility obtained permission from the state’s Public Service Commission in August 2010 to upgrade its entire grid with smart metering technology. There were about 1.9 million meters to change, Butts said, as well as new information technology infrastructure to support the smart meters. BGE divided its service territory into 16 sections and in 2012 began upgrading one after the other with the help of contractor Grid One Solutions Inc.
“We wanted to start in outdoor, primarily outdoor areas in order to test our processes before we got to what we figured would be … the more difficult areas that had more indoor accounts” — namely, Baltimore and its immediate surroundings, Butts said. A $200 million American Recovery and Reinvestment Act grant — one of six the Obama economic stimulus program awarded nationwide for smart grids, Butts said — helped offset the project cost of about $452 million. And BGE’s 2012 merger with Chicago-based Exelon gave the company more information to use in its smart grid implementation. BGE has brought about 90% of its electric customers and about 75% of its gas customers into the smart grid so far, installing more than 1.1 million smart meters. Meanwhile, Pepco and Delmarva Power have finished their smart grid rollouts. 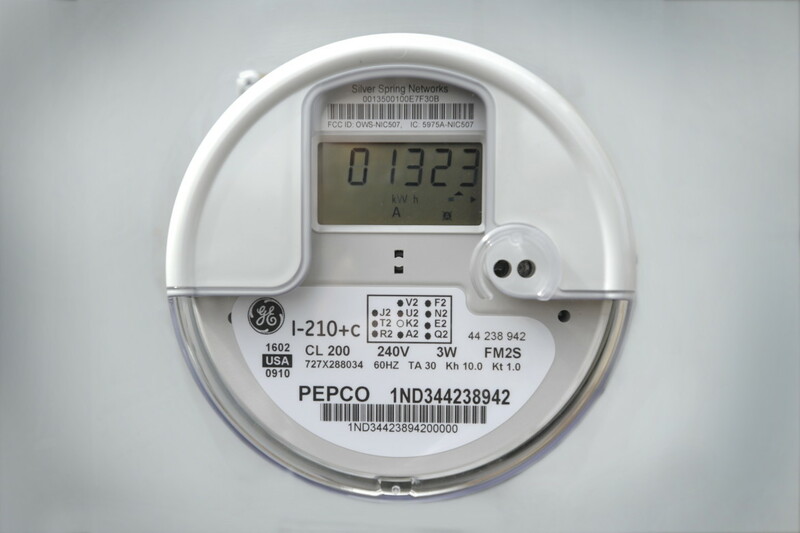 A Pepco spokesman wrote in an email that about 793,000 smart grid customers in Maryland, Washington, D.C., and New Jersey have saved more than 5.5 million kilowatt-hours and received more than $7.5 million in credits on their energy bills since Pepco began upgrading its meters in 2010. BGE’s is by far the largest smart grid in the state; by way of comparison, Pepco and Delmarva have installed about 730,000 smart meters combined in Maryland. But BGE has also encountered the highest rate of customers in the state who have opted out of the smart grid — about 1.5%, or 23,000. That’s compared to about 0.2% for Pepco and 0.5% for Delmarva. In May 2012, the Public Service Commission issued a decision temporarily allowing state residents to write in to their utilities to refuse installation of a smart meter. About 40,000 people did so, Libber said. But in 2014, the commission allowed BGE, Pepco, Delmarva and Southern Maryland Electric Cooperative, which is currently conducting a smart meter pilot program, to charge opt-out fees for customers who refuse smart meters. Now, an opt-out customer must pay $75 up front, plus a monthly charge — $11 for BGE, $12 for Southern Maryland Electric Cooperative, $14 for Pepco and $17 for Delmarva. With that change, the opt-out population has dropped by about half, Libber said. The four utilities had requested permission to charge even more. BGE sought an opt-out fee of $100 up front and $15 monthly from its customers, while SMECO asked for $105.32 and $34.94. Pepco and Delmarva requested $100 up front and $58 per month. “(Utilities) included costs that were clearly inappropriate, totally excluded savings that would accrue to them through people who kept their old meter,” Libber said. Butts said the fees were calculated based on the cost of maintaining a legacy metering grid alongside the new smart grid. The opt-out policy was the subject of two bills in the Maryland General Assembly this year. Senator Nathaniel McFadden, D-Baltimore, and Delegate Glen Glass, R-Harford, worked with Maryland Smart Meter Awareness on legislation that would have brought back the free opt-out policy. McFadden, a former Baltimore principal who still works with the school system, said that while he personally uses smart meters, his constituents should be able to refuse them if they wish without facing a financial burden. Glass, a professional truck driver, said he opposes smart meters because they pose health risks, have inexplicably caused people’s bills to double or triple, and represent “a Big Brother invasion of privacy” because they allow utilities to invade customers’ privacy by monitoring their power use on a daily basis. He said BGE installed a smart meter on his home last year and his bill doubled for the 23 days before he opted out. Glass has sponsored an opt-out bill each year since 2012, but each one has failed. This year, his and McFadden’s bills both died in committee. Smart-meter customers across the state enjoy several indisputable benefits from being on the new grids. BGE’s meters also allow it to pinpoint power outages more quickly and with fewer employees searching on the road, he said. He added that BGE still encourages its customers to report outages by phone, however, as some meters might not communicate with the grid during a major outage. On the company side, Butts said, BGE has avoided more than 70,000 truck pulls thanks to the smart grid, in part because the company can turn a smart meter on and off remotely to turn a customer’s power on and off — for example, if the customer moves. He also said the company has not fired any of its meter readers, instead retraining them for other positions. Anti-smart meter advocates fear the kill-switch technology makes homeowners vulnerable to online hackers. Furthermore, the monitoring capability critics call an invasion of privacy can be used to catch people who tamper with power lines or meters to steal electricity from the system, Butts said. Butts said BGE hopes to reduce its customers’ energy use by at least 1 percent by providing them with more detailed information about their electricity and also by offering rebates for customers who use less power on designated Energy Savings Days. But McFadden and Glass objected to what they called utilities’ plan to dictate customers’ behavior. The advocates also worry that ratepayers will eventually be stuck with the bill for the smart grid projects across the state, though utilities must first prove to the Public Service Commission that the switch was worth it. In such a distrustful environment, the two sides don’t agree on much around smart meters — the science behind them, the benefits and costs they bring, even the conditions under which utility customers can refuse to adopt them. It’s a lopsided fight, too: on one side, huge companies and the U.S. government; on the other, people invoking Big Brother from George Orwell’s “1984” and disputed medical diagnoses. But for supporters and opponents, smart meters are much more important than their unobtrusive appearance suggests.